Where do you feel most alive? If your answer to this question is a place where wild resides, then join the club. Do you explore that place under your own power? And do you want to protect its wild character? If your answer to these questions is Hell Yeah! then welcome home. Home for us is the Ohio River Valley – notice that we are not defined by straight lines and political boundaries, we are defined by our natural surroundings: the troubled yet magnificent Ohio River, mountains that sweep from western Pennsylvania's Laurel Highlands through West Virginia's Monongahela to eastern Kentucky's Appalachians and bluegrass. Home to remnants of the great forests and grassland openings of Ohio and Indiana. Home to Ohio River tributaries that are great rivers unto themselves: the Gauley, the New, the Youghiogheny and many, many others. Outdoors people who understand that adventure is a lifetime pursuit, a lifestyle and an attitude. Adventure, after all, can be found in true wilderness, in urban wilderness and in one's own spirit. Get Out! is meant for those of you who, like me, look for adventure everywhere, starting in your own back yard. GO! will cover the wild and the wacky in our public lands -- from city parks to mountaintops. We will also share stories of the people enjoying and protecting these places. We’ll present our picks on destinations, gear and lifestyle. We'll ask for your thoughts and wild inspirations. And we will represent the real people who partake in everyday and extraordinary adventure -- the old and young, men and women, fat and thin, loaded and lowbaggers, people of all colors and creeds. We’re not sponsored athletes. What we have in common is our love of wild places and that Hell Yeah! spirit. The editorial mission of Get Out! Outdoor Adventure in the Ohio River Region is to inform, entertain and inspire all citizens of the Ohio River region to pursue an active, healthy lifestyle through outdoor adventure and to learn more about how to be stewards of our natural environment. GO! is a web magazine by and for people in the region who participate in outdoor adventure activities such as hiking, cycling, paddling, climbing, skiing, backpacking, wildlife watching, photography and so on. 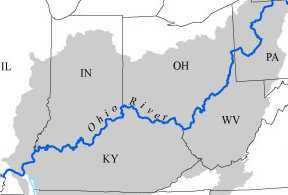 The region is defined by the Ohio River watershed and it includes western Pennsylvania, Ohio and Indiana (excluding the Great Lakes), West Virginia and Kentucky. GO! occasionally forays into the regions of the watershed outside of these state boundaries. Nearly 25 million people live here. Get Out! is interested in providing a full-time or part-time internship opportunity for a college journalism student. Our editorial office is based in Athens, Ohio. The ideal intern candidate would be an upperclass student majoring in online journalism or magazine journalism. GO! is happy to work with your university to help you attain college credit for the internship. The internship position is editorial assistant, with opportunities for web production, writing, supplemental reporting, information gathering, editing and administrative tasks. Reporting and writing experience is a must in addition to knowledge of AP style. For more information, click on the contact link above.